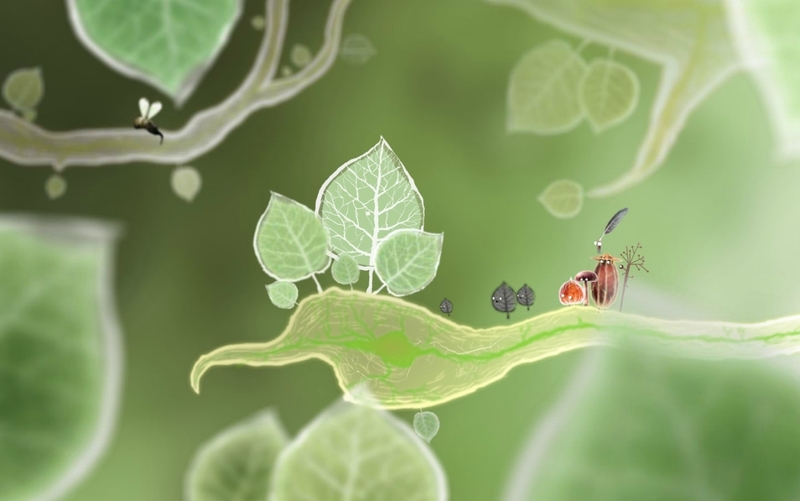 Botanicula, the new point-and-click adventure game by Czech studio Amanita Design, is a charming little thing. Telling the story of a gang of five small creatures defending the tree they call home from giant sap-sucking monsters, it puts you on a journey through a madcap world so infectiously joyful that it should cause any heart of stone to melt within minutes. It does make a few frustrating missteps along the way, especially towards the end, but it more than makes up for them with the sheer imagination on offer. At the beginning of the game the five creatures you control (which you can move around as a group) set out to explore their tree in order to…well, it’s all quite vague, actually. There’s something about monsters stealing a seed and a seemingly magical power, but it’s not very important since the paper-thin story only ever serves to frame the game’s action. Though perhaps ‘action’ is the wrong choice of word. Botanicula moves at the most sedate of paces, and it’s far more a game of contented exploration than anything else. There’s hardly anything that you could call ‘action’, and while there are many puzzles they’re generally quite simple affairs. 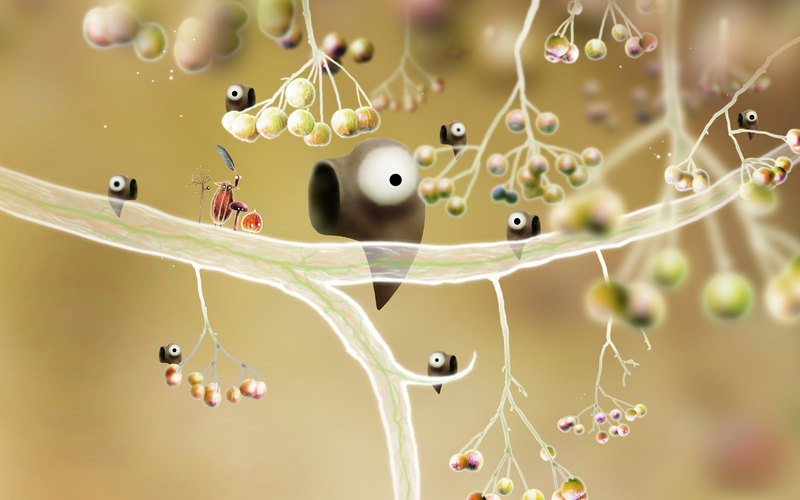 The game, set throughout the tree, is divided into separate scenes, with each contains things that you can interact with. This might be another of the tree’s inhabitants, something to be picked up and used, or an obstacle of some kind. Clicking on these things can allow you to pick up a useful item, sneak past an enemy, or solve a puzzle in order to progress. But this isn’t always the case. The game’s world is a weird, unpredictable place, and so clicking on a plant bud might simply cause it to unfurl whilst flower, and clicking on a group of frogs might cause them to burst into harmonising song. These interactions often don’t serve any kind of practical purpose, but their presence helps make the game feel like more than just a collection of static screens containing puzzles. You’ll also want to click on pretty much everything you can, since in this game every click of the mouse tends to lead to some beautiful animation, some cryptic gibberish conversation, or some funny little surprise. As always with an Amanita game, the environment is beautifully realised, with their trademark flourish and a stunning level of detail present throughout. And it’s this that brings about a great deal of the game’s enjoyment. Each scene is packed with detail, fleshed out with a beautiful art-style and animation, and overlaid with music and a soundscape that further adds life to the world. The world always feels alive and organic, and as you explore you’ll constantly see animals move about, sap pulsing through the tree branch in intricate little veins, and life going on all around you. Creatures are delightfully expressive as they smile at being reunited with their family or burst into tears as you beat them repeatedly in a game of volleyball. Everything just comes together to deliver a near-constant experience of contentedness. And though everything you do is generally quite simplistic, this is never an issue. Puzzles are almost always fun little experiences, and mostly simplistic enough that if you get stuck it’s relatively easy to figure something out without much trouble. It’s not trying to be a puzzle-game- all Botanicula wants to do is keep you entertained for a few hours with its charming world, and unless you’re the most jaded of person it should succeed at doing so with ease. In fact, the game actually tends to fall down a little when it does offer up more difficult, complex puzzles. Since the world in Botanicula is so strange that everything seems to work on a hearty dose of dream logic, it can sometimes seem impossible to figure out what you’re supposed to do when you come to the harder puzzles. And since there’s no in-built hint system you’ll either have to walk around clicking on everything available in an attempt to brute-force your way through the puzzle, or you’ll have to alt-tab out of the game to find a walkthrough online. This only happened two to three times throughout the game, but since it happened overwhelmingly towards the end of the game it did serve to leave a sour taste in my mouth once I had finished. Not only did the puzzles become harder to figure out as the game went on, but towards the end the environment suddenly ballooned out, meaning that instead of having four or five screens to explore with relative ease, there were countless tunnels leading to countless different puzzles, all of which were necessary to progress. And though there are symbols on the walls to help you navigate it was still far too easy to get lost. All this is a shame, since Botanicula is otherwise such an enjoyable, fluid experience. While the final parts do become a little too clunky, and the story ends without really coming to make any kind of sense, it’s pretty much impossible to let that sour taste in my mouth remain there. Thinking back on the game, there were so many moments where I laughed, and so many fantastic little surprises. It was an absolute joy to explore the game’s environments, tinkering with them here and there to see what would happen as smile-inducing music played over to top. In fact, despite the few issues I encountered, there was rarely a moment throughout the game where I wasn’t smiling contentedly. And when a game keeps you near-constantly smiling for around three hours straight, with art that will serve as your desktop wallpaper for months, and a soundtrack that is still playing endlessly on you ipod, it’s hard to let a few minor problems trouble you. 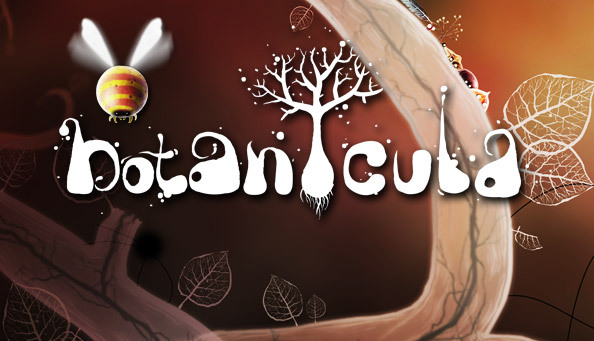 Botanicula is available on PC, Mac, and Linux for around £7. I’d thoroughly recommend it to pretty much anyone, and you should buy the soundtrack while you’re at it. 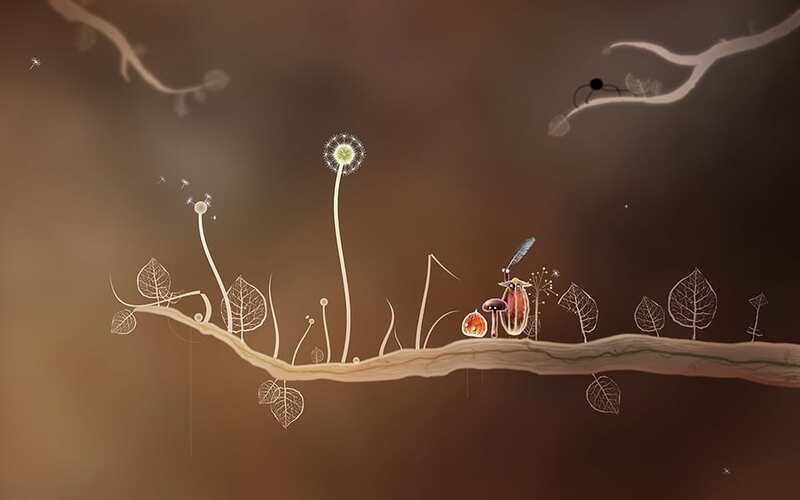 This entry was posted in Games Blather and tagged Amanita Design, Botanicula, Review. Bookmark the permalink.